Hi guys, I have merged all previous Globe inquiries (Globelines, Tattoo, Wimax, etc). We can use this as the general Globe broadband thread. I'll be doing the same for the other ISPs. Mga sirs, kamusta na po ang connection for PS4? Mukang eto na lang kasi ang option ko. Okay naman ako sa globe. 5Mbps Broadband with static IP. Nat type 2. Globe subscribers can probably make use of an IPv6 tunneling like Hurricane Electric. I believe Globe has their own IPv6 tunneling though it only installs to PC. Now just in case the PS4 does not support IPv6 (boo Sony), then a NAT64 configuration can be used which I have no idea how to do nor do I have the necessary equipment for it. Hi guys, globe is offering a fiber plan (50mbps) in our area. Tempted to switch since ok yung switching promo nila. Any feedback on this? I've been back reading and so far mixed yung reviews. For the recent switchers/subscribers of globe, ano masasabi ninyo? Tingin ko, basta wired mas maayos at stable yan kesa wireless. Ang kailangan lang i-consider, kung pag dumami ang subscribers babagal na yung speed nyo. Daniel wrote: Tingin ko, basta wired mas maayos at stable yan kesa wireless. Ang kailangan lang i-consider, kung pag dumami ang subscribers babagal na yung speed nyo. Any idea if I'll still encounter the NAT / port forwarding concern? JoBE2010 wrote: Any idea if I'll still encounter the NAT / port forwarding concern? Wala akong first-hand experience sa wired ng Globe. Wireless kasi ako dati at laging NAT3. Nag-PLDT ako tapos wired, NAT2 ako lagi. Baka ganun din sa Globe. Basta wired na, NAT2 na. Would just like to ask if it's possible to set up port forwarding on a Huawei B593 router (Globe Tattoo Home 4G LTE). 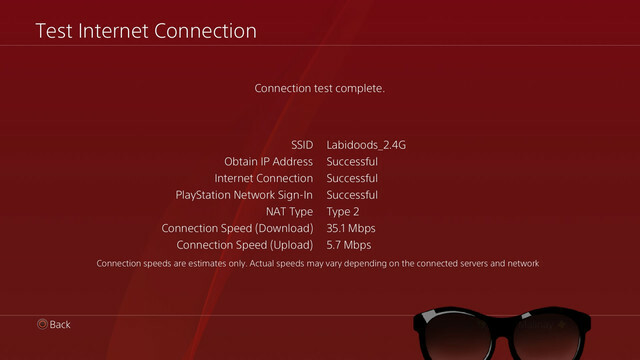 I connect via wifi in my house and it seems that I only get NAT type 3, and therefore I cannot access PSN or even sign up using the PS4 (It shows an error code of some sort). I have searched Google but to no avail, and I've seen some posts that says it's not possible to have an open NAT on 4G LTE. Is there any workaround to this so I can access PSN? Thanks and good day! Welcome to Pinoy PlayStation, rn1dpb1n! We normally get NAT Type 3 when we connect wirelessly to the internet. I mean if the modem is wireless, it will always get NAT 3. If it's wired, it will easily get NAT 2. - Go to "Set Up Internet Connection"
- Select Wifi/LAN depending on what you use to connect. I just recently subscribed to Globe's 1899 plan which has up to 50Mbps speed. I haven't really tested it extensively with the PS4 but the download speeds are really fast. Last edited by slaughterbit on Fri Dec 01, 2017 8:06 pm, edited 1 time in total.